The tinsel has been packed away for another year, the tree has been recycled and most people are reeling from festive overspend and looking at how to survive January on the contents of their freezers. With four major retailers releasing trading figures this week, PRWeek assesses how their Christmas campaigns translated into sales, with the help of Andrew Bloch, founder of consumer PR agency Frank PR. As news emerged today that Blue Rubicon has ended its relationship with Sainsbury's to work for Tesco, the signs are that at least two of the major supermarkets are taking active steps to reposition themselves in the minds of consumers, following some challenging results over the festive period. The buzz was palpable, people wept at the message of love contained therein and a star was born when John Lewis unveiled its ‘Monty’s Christmas’ campaign featuring a boy and his favourite cuddly toy, magically brought to life by the latest CGI graphics. The film was supported by an integrated campaign that saw John Lewis stores transformed into a winter wonderland fit for an endangered penguin, together with window displays and a chance to use technology that could bring any child’s favourite cuddly toy to life on screen. The retailer was rewarded for its efforts with a 4.8 per cent hike in sales in the five weeks to 27 December, easily the best results of the four retailers featured. The campaign was created by adam&eveDDB and PR support was by Brands2Life. Andrew Bloch says: "John Lewis has set the bar very high when it comes to Christmas campaigns and it really thought through how to make the campaign work as hard as possible for it. It is clear that this was the most integrated campaign. Yes, it worked hard to get the ad amplified but on top of that it worked hard to link back to products as well as online and in-store sales. Positive sentiment and brand warmth is very nice but it’s about getting the cash registers ringing as well as getting people to think about John Lewis." Sainsbury’s First World War-themed film had all the hallmarks of a big-budget film production. It took the viewer on a journey through the famous Christmas Day truce in which German and British troops played football between the trenches. Peace, goodwill and a message of sharing were the order of the day but the film attracted controversy for its use of wartime imagery during a sensitive year. There were also charges of hypocrisy levelled at the supermarket over plans, which it denies, to build a store on the site of a war memorial stadium in Bristol. The film linked to a chocolate bar, the profits from which were donated to the Royal British Legion. The campaign was created by Abbott Mead Vickers BBDO. Andrew Bloch says: "Sainsbury’s did exceptionally well to in terms of the awareness it generated, although the campaign attracted controversy on social media. I thought it did well to link back to charities and worked hard to link back to products, such as the chocolate bar at the centre of the ad. Overall, it did well to get a share of the voice. Sainsbury’s and John Lewis were the clear leaders in that race. They did exceptionally well and should be pleased with how it went." A mysterious Twitter-based PR campaign exhorted people to "follow the fairies" for at least a week before M&S unveiled its glamorous ‘magic and sparkle’ film featuring pretty fairies granting the unspoken wishes of the great British public. The campaign was created by Rainey Kelly Campbell Roalfe/Y&R with PR handled by Unity. Andrew Bloch says: "For me it was the most creative of the four offerings. The idea of ‘magic and sparkle’ translated well and the execution was beautiful and clever. It was brave to commit to all the activity in the run up to releasing the ad before announcing it was M&S. There is a question here over whether consumers at Christmas have the head space to wonder who was behind it and one runs the risk of people missing the big reveal. M&S is trying to make the brand relevant to a younger audience, which is evidenced by its emphasis on online activity. I’m unsure whether it did enough to change perceptions of it as a brand. Did the campaign drive awareness of its product range? Whether it got the balance right is a question that remains unanswered. In summary, it was exceptionally good creative activity but perhaps that was not enough." Tesco’s campaign featured parents variously searching the attic for the Christmas decorations of yesteryear or trailing around a supermarket with children in tow, building up to a denouement in which the switch is flicked on multiple family displays as well as those of the eponymous supermarket. The campaign was by Wieden+Kennedy London. Andrew Bloch says: "Tesco has had challenging times of late. 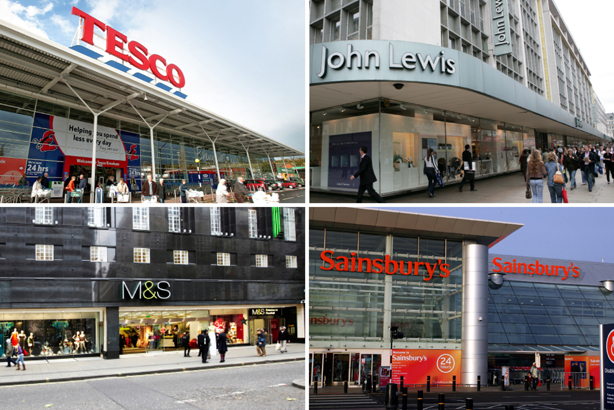 It is stuck in the unenviable position of being squeezed from both sides – by upmarket retailers and by the cheaper retailers. I’m not sure the ad did enough to differentiate its offering from that of its competitors. Did it build an affinity between it and consumers? Not particularly. The ad did not feel like especially ownable territory. I’m not convinced it did enough and that is, perhaps, reflected in its sales." The overall picture presented by the trading figures points to a battle for hearts and wallets which only intensifies during the Christmas trading period but which is a constant feature of the UK supermarket landscape. Tesco and to a slightly lesser extent Sainsbury’s are locked in a fierce battle with the discount supermarkets Aldi and Lidl and need to reposition themselves to consumers as leaner, more transparent organisations. Marks & Spencer's problem, by comparison, is how to appeal to a new generation of younger consumers who might not have a natural affinity for its brand. This week’s invitation by Sainsbury’s for agencies to pitch for one of three briefs for the brand, including corporate comms, and corporate responsibility is, perhaps, evidence that the repositioning process could begin in earnest this year. Blue Rubicon, which previously worked for Sainsbury's, has ended its relationship with the supermarket to work with Tesco, it emerged today. This could be the point, together with this week's announcement of the closure of some of its unprofitable shops and a corrresponding surge in its share price, at which the ailing Tesco begins to turn the tide. Bloch also believes that a ‘John Lewis phenomenon’ is starting to emerge in which the big Christmas campaigns are eagerly anticipated by the public; a Christmas miracle in its own right in an age where consumers are cynical about the constant bombardment of messaging from brands. He says: "The stakes are high but there is an audience ready and willing to receive what you want to tell them. To get it right, they have to realise that it is not just about creating buzz; it’s about driving traffic in store and online and, to be successful, the campaign has to be completely integrated into the business." But how much of an effect can a good, or bad, PR campaign have on sales? Bloch thinks there is a limit. He says: "When its successful, a PR campaign can have an enormous effect on a brand. But a Christmas campaign is not a magical gift from Santa that can solve all the underlying challenges a retailer has faced during the year leading up to it." The four retailers were contacted but were unavailable to comment at the time of publication.